It’s a brand new year, and many people make their resolution around the topic of getting fit or exercising more often. What Total Gym has for you is not only some exercises to jumpstart that resolution but equipment that will take those exercises to a new level. 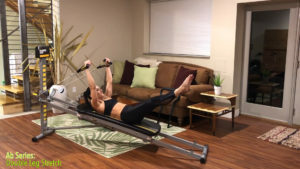 These two functional pieces of equipment can really serve to complement each other when used in tandem to progress or refresh your at home workout. Both Total Gym and TRX each utilize suspended bodyweight as the load and provide environments for full body workouts where the core is engaged throughout the progression of your workout. Hanging a TRX Suspension Trainer at the base of the Total Gym creates an opportunity to integrate the two pieces of equipment. This will further destabilize the body during specific TRX and Total Gym exercises and allows for advanced TRX exercises to become even more challenging. In 2004, Randy Hetrick, former Navy seal commando, came to our San Diego offices to meet with Total Gym creator Tom Companaro about his new invention, which consisted of multi-purpose handles and suspension straps. Campanaro immediately encouraged him to bring what is now known as TRX Suspension Trainers to market. Basically this simple, portable device gives you a total body workout in a fully functional way, using only bodyweight as load. Many TRX exercises progress from simple beginner exercises, to complex advanced movements, however most TRX exercises are extremely challenging from the onset considering they are always activating the core. For typical TRX usage, one’s feet or hands are planted or anchored on the floor in a stable position, while the other extremities are holding on to or affixed to the TRX Suspension Straps, which typically hangs from the ceiling or a tower. TRX exercises include most of the typical movement patterns – Squat, Lunge, Push, Pull, Twist and Bend. When you integrate the TRX suspension of one extremity, say the feet, with the destabilizing suspension of the Total Gym moving glideboard, say for the hands, (see photo inset) you create the sensation of flying with all movement generated from the core. This combination creates a powerhouse workout for the powerhouse of the body – your core muscles, which are the energy source that governs the quality of all your primal movements. Take a look at our video with Total Gym Master Trainer David Snively, who is also a TRX Master Trainer. When using the TRX and Total Gym combination, your body is anchored by the glideboard rather than the floor. When the glideboard is in the closed position at the bottom of the rail, the exercises are more stable. However, when the glideboard is open or in the rolling position, the exercises become destabilized, which challenges the body to become more stable, thus activating the core muscles. 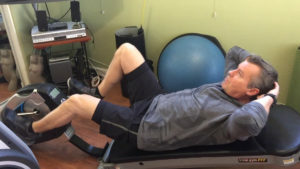 Notice how David progresses from some easier beginner exercises – that prepare the body – to more advanced exercises. Be sure to do the same when you begin to incorporate TRX exercises into your Total Gym workouts. Building on the versatility of Total Gym by adding the simple integration of TRX exercises is the perfect recipe for refreshing your exercise repertoire, moving past that plateau and on to the next set of fitness goals for the New Year. Changing up your workout every three to four weeks triggers muscle confusion, which helps to overcome any plateau that may set in due to muscle memory and repetition. Not to mention, the TRX/Total Gym integration is fun, exhilarating and, challenges you to get to that next level of the best YOU. I love this combination and have been doing it at home with both my TRX, Total Gym, and Pilates reformer. It’s training like a gymnast with your feet on the ground for many of the exercises. It’s a great progression for many users before they expose themselves to full body suspension training. Also add a little vibration and it goes to the next level.